﻿ Why can’t we just use Google Translate instead? Why can’t we just use Google Translate instead? 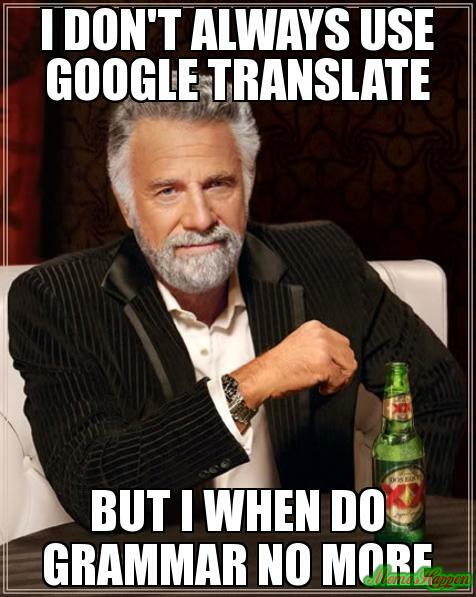 Anyone who can speak another language or has had to translate from one language into another will have come across the question: ‘Why can’t we just use Google Translate instead?’ – This is a question that frustrates a lot of translators as well as language learners. Today we’re looking at the role of machine translation tools like Google Translate and other computer-assisted translation software within the industry. We’ll be asking the question: Will we ever be able to rely fully on machine translation and no longer need human translators? Basically using CAT tools means that more work gets translated within a shorter time! But what about MT where the software itself does the bulk of the work? Here, the translator’s role is more like that of an editor, rewriting and amending parts of the text that have not been successfully rendered into the target language by the machine. In some ways, this is just as much work (if not more!) for the translator as if they were to have written the entire translation without any technological assistance. The language produced by machine translation is often unnatural and does not read fluently. We only need to look at a classic example of Google Translate gone wrong to see that machines aren’t always the most reliable of translators! Exhaustion scandal – Examination report defused? Too much indulgence with the car industry? The clearing-up of the diesel co-operatives is intended to have agreements between the Kraftfahrtsbundesamt and Autobauern. Critical passages should then have disappeared from the examination report. As we can see, sometimes machines get it wrong. They may not have certain words in their translation databases and they certainly don’t have the same cultural understanding as humans. So while there will definitely be technological improvements in the future, it seems that the role of the translator is safe for now. Can I record and email for translation? Can you explain in a bit more detail? I think your info on google translate is outdated. They are rolling out out a neural network based system and to quote “It has improved more in one single leap than in 10 years combined,” Barak Turovsky, the product lead for Google Translate, said during a press event at Google’s San Francisco office. If you search online you will discover an article from a Japanese Scientist who was astounded at how much the system improved overnight and explains how the system learns very quickly. Unfortunately for workers involved in this area and that of similar tasks, machines will replace 99% of the work. I agree that the technology is reducing the workload but unless Google finds a way to breathe a soul into a computer, a machine will never fully take a human’s place when it comes to conveying and interpreting the meaning of a foreign language. I will never trust a machine translation without at least proofreading. 30 years ago (that long, admittedly), I held a paper in English at a German institute. I had provided my text and both English and German abstracts. What did they do? They ran my English abstract through a translation machine. The result sounded horrible! We want to translate some technical catalogues from Italian language to Bengali or English language? Is it possible? Please use our quote form and provide us with a bit more detail. As a teenage student, I feel that translation websites can cause more confusion as you think that the ‘grammar’ (as in the word order it gives you) is a different, but correct way of writing what you want, it is normally incorrect; sometimes it can even get the gender wrong. I feel that you might as well use your current knowledge or use a dictionary. I absolutely agree! When I’m reading or writing something in French, I’ll often use Google Translate to quickly look up a word, but more often than not I’ll end up checking in an actual dictionary and/or asking a native speaker friend to ensure I’m using the best possible word. There are so many nuances in translation.